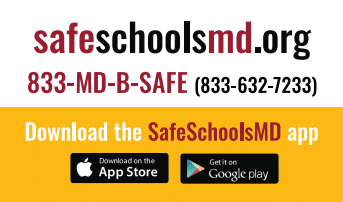 Governor Larry Hogan recently announced the launch of “Safe Schools Maryland,” a tip line and mobile app designed to streamline reporting of possible threats to students and school facilities. The Governor made the announcement at the Maryland Emergency Management Agency (MEMA) with student leaders, education officials, members of law enforcement and others in attendance. This resource will serve as an effective tool for communication between school communities, school safety personnel, and law enforcement. 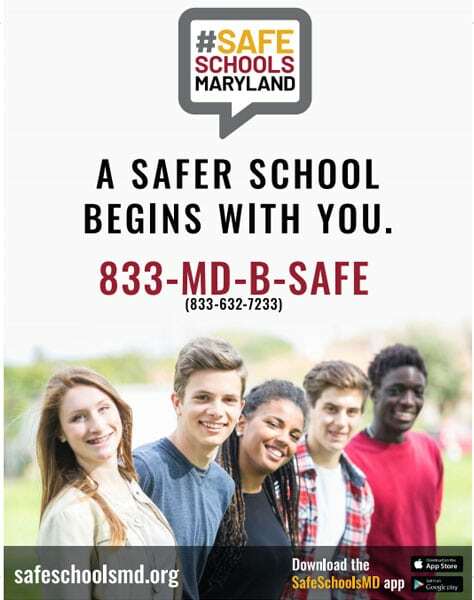 Students, family members, parents, teachers, administrators, and other community members can anonymously report information to Safe Schools Maryland via a mobile app available for download through the Apple App Store or Google Play, online at www.SafeSchoolsMD.org, or by calling 1-833-MD-B-SAFE (1-833-632-7233). Trained technicians will respond to reports 24 hours a day, seven days a week, 365 days a year.